What is C and R in OSPF debugs? Have you ever seen such type of debug messages with R and C values? Yesterday I was busy in doing some lab exercise & find the above logs in debugs. Then I analysed the logs carefully and conclude one thing about C and R value. C stands for local router & R stands for remote router. Above mentioned logs clearly depict that the subnet mask used by remote router is 255.255.255.252 and local router is 255.255.255.0. With addition to this they tell us about the dead and hello intervals of local and remote routers. By analysing the logs you can quickly come on to the conclusion regarding their problems in forming ospf adjacency. One picture is very much clear from the logs that the link used by router is not serial link because serial link never carries the subnet mask. In case of serial link subnet mask is always used by OSPF is 0.0.0.0. An unprecedented attack on Mumbai dated 26 November 2008 made by perpetual guys of age 20 – 25 years. The mission was planned in such manner so that it can go for long with maximum number of living being made dead. You will be weird to see such type nationalism post on service provider blog. Actually I am relating the Mumbai Issue with computer networks. We as Indian trying our level best to kill the terrorism from its roots but all in vein. Instead of killing terrorism we should march towards security. Still we are not learning from our mistakes and just because of this we are f*****. The same scenario is with computer network security; today we are not taking any type of precaution but what happens when attack comes on the network? Every time we face the problem and pledge that next time we will do our level best but after the completion of event we used to forget everything. Is this the right approach, “ask yourself”. If you want to see the approach then tries to learn from Nation Security Guard (NSG). The approach followed by them is really splendid. Why I am commenting on their approach because they make a plan first of their target and who can be affected with that. Target is militants in case of computer networks target is virus or hacker & civilians are affected in case of computer networks simple data packets will be affected. So NSG decided to go via roof instead of ground floor because they know that the militants sitting on top storey can fire them easily and civilians will be affected. The same when we the network is hacked or behaving like hell try to think like cool never do the things in hurry which creates mesh for you ahead. Another thing which we need to learn from NSG is patience. Why I am talking about patience because sometimes we lose our patience during network attacks & did the things blindly. So never do such type of mistakes during network attacks; tries to collect the data; I know at that time your network is on stake and you are stakeholder. But mind one thing if you are not able to get the roots, roots can be collected in terms of data then the same can be happened at any time and at time you will not have any work around. In this way may be a small problem will get in your nerves and let your network down for long or short time. One thing which I liked the most i.e. behaviour of politicians which was totally different. Instead of blaming to each other which they used to do but this time they come up as a single group and with one word need to save India. Really very realistic & patriotic approach. We as network operators or service providers need to follow the same approach instead of saying that my network is secure and I have nothing to do with other networks. Now the time has come we need to pull up the reins of security instead of fighting with terror or network attacks. If you checked the major incidents they happened just because of lack of security. So we need to design the security model in such a way so that the risk of terrorism or network attacks should be minimized. What we are facing today it is just because of our mistakes? At last I would like to say one thing never fight against terror always try to fight against security and get it implemented as soon as possible without losing our beloved ones or computer data. How to perform the summarization for odd or even subnets? Still I remember the day of 22nd February 2008 when I was asked to perform the summarization of only odd subnets in my CCIE lab. It seems a hard job in the first seen but you really enjoy when you come to know it’s actually not as hard as you are thinking of it. Before moving ahead you should be familiar with the concept of summarization. When we talk about the permission of odd or even subnets it means you have to create an acl in a smart way so that it must allow the only subnets which are not divisible by 2 for odd subnets or divisible by 2 for even subnets. Start playing with the binary. For example we want to allow only the given odd subnets in the acl. For this we require the network address as well as its subnet mask. Check the pattern of the first bit which is always set to 0. Here is the logic. It means for all even numbers the first bit will always be 0 & will be 1 in case of odd numbers. Now create the wild card mask put the 1’s where the bits are changing & rest will be as 0. Network is 10.1.0.0 & wildcard mask is 0.0.14.0. By doing same steps you can calculate the wildcard mask for odd subnets also. Does this type of summary or acls required in real life scenario? May be the answer is no but I think it can be used where you are having two links and you can advertise the odd subnets from the one link and even subnets from the other link. But what will happen if a link goes down? When will you get the answer kindly reply to my post? If you are working in a service provider network then might be facing a problem of links flapping whic are attached towards the cpe. A very common issue which is always being ignored many times. But during the log analysis we always a weired error of receiving bpdu which smaller cost and most of the time we hardly diagnose the probelm. So eventually one of my collegaue added a command callled spanning-tree bpdufilter enable. After adding the command the link flapping stopped. After that we analysed what happened after adding the command, why the link flaping stopped suddenly and as soon as we removed we get stucked into the same. Actually from clinet end superior bpdu are receiving by the switch port and due to which port may be going in block state. After adding the command whenevve the switch receives the bpdu from clinet end it sliently drops it and issue resolved smartly.So we finalize make a best practise of adding the command to every client facing interface. Yesterday cisco started virtual summit on topic "You & Cisco:Succeeding with Managed Services" approx 167 people joined the conference across the globe. The main agenda of the conference was to launch the managed services. Cisco named it Cisco Powered Program. The defination of Cisco Powered Program states that they will dive into the market with their partners to provide manage services to the customers.It serves members in all aspects of the service lifecycle from launcing a service to market and sell it at last.Cisco’s expertise in creating network-based services, as well as the strong Cisco brand and its reputation among businesses, to launch and sell sophisticated and differentiated new services. The virtual summit is Efficacious way to deliver conference across the globe which feels like the same you are sitting in fromt of the speaker. I think they are using telepresence for the same. It was a good experience and you should join it once. Have you ever think of that what will happen if you are not going to use loopbacks in your MPLS enviorment. The same has been tested in test lab and you will be stumbled across to see the results. Prior reading to this article kindly have a look on PHP first. As per LER-1 output tag 16 is used for forwarding. It means outgoing label is 16 and it will become the incoming label of LSR-1. LSR-1 is getting imp-null from 10.1.1.6. It means IGP tag is removed here and packet will be forwarded with VPN tag only. In the above output we actually get the reason for not pinging. The reason is Penultimate Hop Popping (PHP). Actually LSR-1 is getting imp-null from LSR-2 because 10.1.1.8/30 is directly attached subnet. Because of PHP LSR-1 is removing IGP label before forwarding to LSR-2. So LSR-2 is receiving the packet with vpn label and it LFIB it is not able to get the label and subsequently packet drops at LSR-2. From figure 1 you can see the PHP is happening twice for 10.1.1.8/30 subnet because it is directly connected to LSR-2 & LER-2. After creating loopbacks PHP will take place only once and IGP label will be removed by LSR-2 and end to end ping will be achieved. All of you are might be aware of super backbone concept in mpls. No issue if you don't know I will let you in couple of words. As per super backbone concept service provider network will work as area 0 for customer links. It means for every vpn which is using OSPF as PE-CE routing protocol no need to configure area 0. Without introducing area 0 all links of the vpn can communicate with each other. This is all about super backbone concept. But what happens if customer will use area 0 in his network. So simply ask customer to extend area 0 till your PE but as per my experience none of the customer will do that. Consequently an immense problem can occur if customer will not extend the area 0 till PE. Click here to download the full solution. Yesterday Cisco has launched ASR 9000 series routers for service provider network. For more you can view Cisco ASR As per Pankaj patel "There’s a lot to digest there, but in summary, I look at this as a great example of Cisco innovation - it took four years and more than two hundred people to design what our service provider customers need in anticipation of things to come. While Ira’s journey may be over, the journey of the Cisco ASR 9000 Series is just beginning. And the journey of Cisco, bringing innovative solutions to market to help us all achieve the infinite possibilities the network has to offer is still strongly and resolutely continuing." Cisco Systems unveiled a supercharged router called the ASR 9000, which is capable of moving 6.4 terabytes per second of traffic. The router is aimed at service providers with next-generation networks which plan to run bandwidth heavy services such as video, IPTV, mobile broadband, and more. With the explosion of Youtube videos, and other bandwidth-hungry apps, service providers are looking to stay ahead of the bandwidth demand curve. The ASR 9000 hopes to address that need with the ability to support the future "Zettabyte era". The ASR 9000 router is capable of transmitting data at a rate of 6.4 trillion bits per second, and it has 10 times the bandwidth capacity of Cisco's ASR 1000 router. The Cisco ASR 9000 Series also features a fully integrated timing infrastructure, allowing the routers to take in timing inputs (Synchronous Ethernet, Building Integrated Timing Supply [BITS], Data Over Cable Service Interface Specification [DOCSIS] Timing Interface [DTI] etc.) and distribute them over the backplane to each slot. This capability allows rich support for transparent mobile convergence; mobile Radio Access Network (RAN) backhaul; and Time-Division Multiplexing (TDM) circuit emulation, without sacrificing performance or scale. With reference to my last post on Interrupt Context Switching Vs Process Switching; I am explaining more on to the Interrupt Context Switching Mechanism which is being used by Fast Switching, Optimum Switching & CEF Switching. All the three mentioned switching techniques uses the cache. So you can see how the cache is used by the switching methods and becasue of that cache fact it is said that cisco uses interrupt context switching. Fast switching stores the forwarding information and MAC header rewrite string using a binary tree for quick lookup and reference. In Fast Switching, the reachability information is indicated by the existence of a node on the binary tree for the destination of the packet. The MAC header and outbound interface for each destination are stored as part of the node's information within the tree. The binary tree can actually have 32 levels. In order to search a binary tree, you simply start from the left (with the most significant digit) in the (binary) number you are looking for, and branch right or left in the tree based on that number. For instance, if you are looking for the information related to the number 4 in this tree, you would begin by branching right, because the first binary digit is 1. You would follow the tree down, comparing the next digit in the (binary) number, until you reach the end. Optimum switching stores the forwarding information and the MAC header rewrite information in a 256 way multiway tree (256 way mtree). Using an mtree reduces the number of steps which must be taken when looking up a prefix. Each octet is used to determine which of the 256 branches to take at each level of the tree, which means there are, at most, 4 lookups involved in finding any destination. For shorter prefix lengths, only one−three lookups may be required. The MAC header rewrite and output interface information are stored as part of the tree node. Cisco Express Forwarding also uses a 256 way data structure to store forwarding and MAC header rewrite information, but it does not use a tree. Cisco Express Forwarding uses a trie, which means the actual information being searched for is not in the data structure; instead, the data is stored in a separate data structure, and the trie simply points to it. In other words, rather than storing the outbound interface and MAC header rewrite within the tree itself, Cisco Express Forwarding stores this information in a separate data structure called the adjacency table. In my post Why ospf vpnv4 routes look as external route explained that the problem can be overcome by changing the ospf instance id across all instances. But the same can be acheived by changing the domain-id also under ospf vrf instance. In MPLS enviornment the recieving PE will match the packets on the basics of domain id. If the domain id is different then PE thinks the packets are coming from the other domain and treats them as external routes which can be seen at customer end side. So by changing the domain id same on both PE it treats the packets are coming from its own domain and delivers them as inter area routes. PHP is penultimate hop popping which means remove the label one hop before its destination. 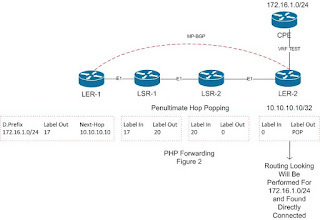 In figure 1 LER-1 wants to reach on CPE lan for this it is getting route from LER-2 with its loopback as next-hop address. For loopback it will check the routing table lookup and reverse lookup will be performed. After that packet will be forwarded to the next router and same process will be followed till it reach LER-2. You can see the label exchange on LER-1 which is pushing a label of 17 and forwarding to LSR-1. LSR will swap the label with 20 and forward the packet to LSR-2. LSR-2 will swap the label with 21 and forward to LER-2. Now LER-2 will check this is the directly connected interface and label will be popped off and normail ip packet will be delivered. Lets see in figure 2 what will happen in case of PHP. The packet will be forwarded to the next router and same process will be followed till it reach LER-2. You can see the label exchange on LER-1 which is pushing a label of 17 and forwarding to LSR-1. LSR will swap the label with 20 and forward the packet to LSR-2. Now LSR-2 will forward the packet by removing the label. When LER-2 will get the packet it has to do perform only ip lookup. This is case of directly connected interface. But in case of VPN when the CPE routes will be forwarded a vpn label is also forwarded along with MP-BGP. So a packet consists of two labels one is vpn label and another is ip label. The top label of stack is always igp label and inner label is vpn label. So when PHP will perform on LSR-2 it wll remove the IGP label and forward the packet with vpn label. On LER-2 it wil check it is for my directly connected interface and vpn label will popped off and normail ip packet will be delivered to CPE. Note:- For directly connected interfaces and summary addresses always label 3 will be advertised to adjacent neighbors which is used for PHP. If you are getting double traceroutes in MPLS cloud then definately you are running with cisco bug CSCef16357. From one of the thread Click Here I come to know about that bug. Cisco has clearly mentioned that this is the hardware issue of sup720 in 6500 chassis. In a MPLS/VPN environment, egress CE is seen twice in traceroute. This is an hardware problem and cannot be fixed by software.